The 60' ft. granite monument leads the way to the extensive National Park which features well-manicured grounds with markers, both big and small, indicating the successful launching and landing points, a visitors' center, and a cluster of museums and exhibits which celebrates the last century of flight and beyond. For a tutorial on all things aviation, from the first successful glide across the Kill Devil Hills sand dunes to the new breakthroughs from NASA, a trip to the Wright Brothers National Memorial is a must. Part historical monument, part museum, and part park, an exploration of the Wright Brothers National Memorial is an afternoon trip that everyone in the family will find simply awe-inspiring. Naturally, the Wright Brothers National Memorial would never exist without the astounding flying feats of the Wright Brothers, two brothers from Ohio that ran a bicycle shop while they dreamed of mastering the still just-out-of-reach achievement of flight. For years, the Wright Brothers designed intricate plans and blueprints out of the their small bicycle shop before heading to the town of Kitty Hawk in 1900. This coastal town, they determined, had the ideal conditions for testing their gliders, with towering sand dunes and consistent winds to assist with the initial launching. They were already putting their experiments to the test in the fall of 1900, with a test launch of their first glider. During these tests, the glider was secured with ropes so the brothers could practice controlling and maneuvering the structure 100' feet in the air, without the possible injury that could occur with an actual rider on board. Their subsequent 1901 glider was created with more lift, a direct result from the findings of these early Outer Banks experiments, and an expansive wingspan. This glider underwent nearly 100 test flights in July and August of 1901, many of which with successful and safe landings. Still, the brothers were unsatisfied with the overall lift, which adversely affected both the height and the length of the flight, and restarted their experiments, this time with the use of a makeshift wind tunnel. This way, the brothers could test drive literally 200 different types of wings without taking to the sky for every experiment, and building an entirely new glider with every test. The next phase was a 1902 glider, which was launched as an unmanned kite, and featured several new features that were the results of their wind tunnel tests. This glider featured a rear rudder, a flatter airfoil, and longer and narrower wings. These factors helped give the brothers the vertical lift they were aiming for, but provide to be ineffectual in turns, essentially dragging the rider one way or the other depending on the wind direction or other factors. The Wright Brothers realized that half the point of flying was the ability to control one's direction, and went back to the drawing board. The powered Wright Flyer I was constructed in 1903, with a 4-cylinder water cooled vertical engine surrounded by a lightweight wooden glider. After a series of wind tunnel tests and delays due to broken propeller shafts, on December 14th, 1903, the Wright Brothers flipped a coin to see who would take the Wright Flyer out for its first official test drive in Kill Devil Hills. Wilbur won, and made a successful 3 second fight before touching down. After several days of breezy weather, the experiment was repeated on December 17th, this time with Orville at the wheel, and the flyer made two successful flights from level ground into a cold headwind that blew at 27 mph. The first flight lasted for 12 seconds and covered only 120 feet of distance, but it was long enough and far enough to change the world. There were just five witnesses for the world's first successful flight: John T. Daniels, who took the iconic "first flight" photo using Orville's camera, Adam Etheridge, and Will Dough, who were all members of the U.S. government coastal lifesaving crew. Also in attendance was area businessman W.C. Brinkley, who was a curious bystander, and Johnny Moore, a local teenager who wanted to see what all the fuss was about. Though the Wrights would spend years legitimizing their first flight, Kill Devil Hills and Kitty Hawk were instantly put on the national map, and the two towns, which in most circles had never been heard of before, were now headliners and household names. In the 1920s, after years of debate and competing first flight claims, the government decided it was time to publically recognize and honor the Wright Brother's status as the first pioneers of aviation, and plans began to build a monument honoring the Wrights' achievement. Orville was alive and well at the time, however Wilbur had passed away in 1912 at the age of 45 due to typhoid fever. Competing designs and campaigns carried on for years, particularly in Dayton, Ohio and the Outer Banks, North Carolina where the two areas were fighting to be recognized as the birthplace of flight. In 1927, President Calvin Coolidge put a temporary, (but certainly not permanent), end to the feud and signed a bill assigning $50,000 to build Wright Brothers Monument National Memorial in Kill Devil Hills. The design was officially selected in February of 1930 based on a plan provided by Rodgers and Poor, an architectural firm from New York. Construction began just 18 months later, and by this point, an additional $150,000 was pledged to the construction, resulting in a $213,000 granite monument that was completed by November of 1932. The structure contained 1,200 tons of granite, 2,000 tons of gravel, and over 800 tons of sand to create its high base. A Memorial Dedication was held on a particularly windy day on November 14, 1932, with Orville Wright as the guest of honor. The ceremony also marked one of the first instances where a living honoree was in attendance at their own memorial. In 1953 the National Park Service received the go ahead to reconstruct the two Wright Brothers' gliders in honor of the 50th anniversary, and from this original idea, an expansive visitors' center and museum was built turning the Memorial site into an actual National Park. 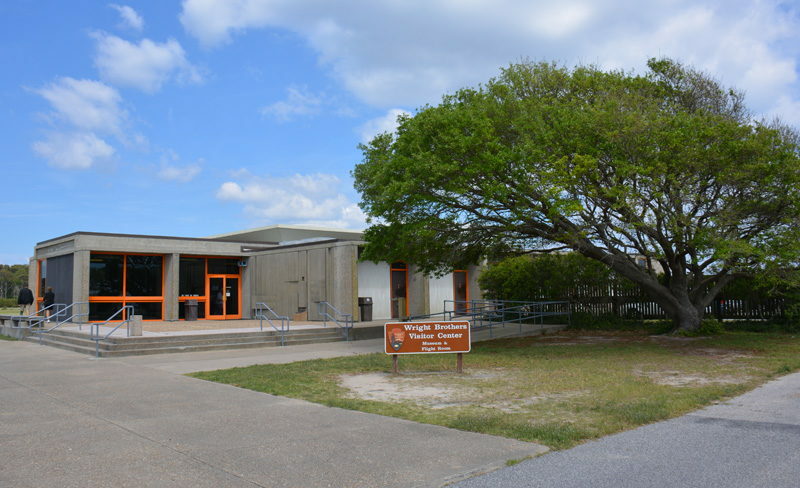 While both the gliders and the visitors' center would be rebuilt over the years after hurricane or termite damage, the museum and the national park proved to be one of the growing Outer Banks' most popular tourism attractions off the beach. In 2003, the small town of Kill Devil Hills and the Wright Brothers National Memorial would once again come into the national spotlight as the nation and the world celebrated a century of flight. Acclaimed visitors and honorees flew into Kill Devil Hills from all across the country, including Neil Armstrong, Buzz Aldrin, then-president George W. Bush and John Travolta. A week of special events and celebrations were held at the site, and a new museum, the Centennial of Flight, was constructed specially for the 100 year anniversary and was officially dedicated on December 17th, 2003. Today, aviation lovers had to the Outer Banks from across the country to pay tribute to the birthplace of aviation. 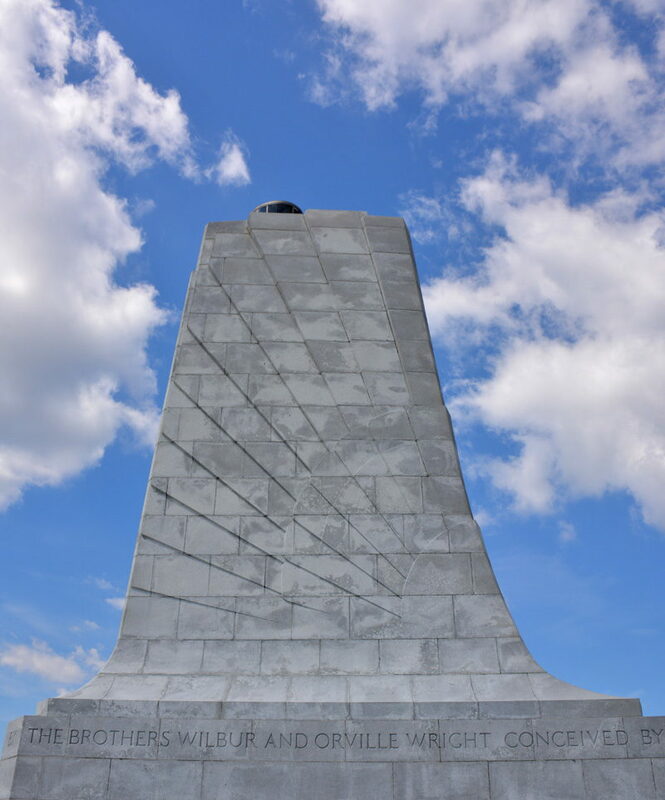 From aviation's earliest roots to the new heights to be reached on the horizon, the Wright Brothers National Memorial does an incredible job of honoring aviation's past, present, and exciting future. The biggest lure of the Wright Brothers National Memorial National Park is naturally the monument itself. Once entering the National Park grounds, visitors can park and trek up the gradually sloping grassy hill to the top, to have an up-close perspective of the granite structure. A reproduction of the launch rail is located not far away, as are the small monuments marking the exact first and second landing spots. The gradual incline makes it a slightly long but leisurely walk for all visitors and everyone is encouraged to bring a camera along to capture the monument from all angles. From the ground looking up to the structure at the base of the park, to an up-close shot of the "Wilbur Wright Orville Wright" carved into the granite stones, virtually every perspective of this impressive monument presents fascinating views and worthy photo ops. 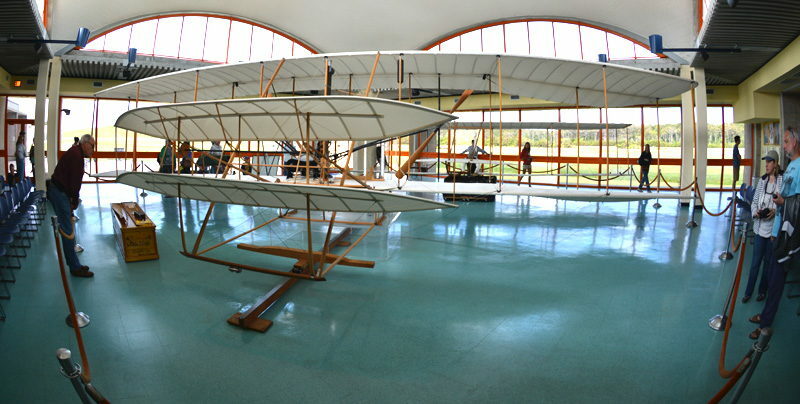 After the climb, head over to the main visitors' center / museum which features a full scale reproduction of both the 1902 glider and the 1903 flying machine, as well as an engine block from the original 1903 flyer, and a precise reproduction of the wind tunnel that the Wrights used to conduct their early experiments. Interpretive displays are located throughout the museum, and seasonal free programs are available to visitors throughout the season, including "flying tests" with paper airplanes, kite building demonstrations, and "Flight Room Talks" which are short sessions that recount the whole story of the Wrights success and failures in Kill Devil Hills. Nearby, visitors will find the Living Quarters and Hangar, replicas of the structures that the Wright Brothers called home during their lengthy experiments, and located in almost their exact original locations. The living areas are furnished with items like the ones the Wrights would have brought with them, and the hangar is an exact replication of the original storage area for their famous 1903 Wright Flyer. At just over a decade old, the newest attraction at the Wright Brothers National Memorial is also one of its most popular. The Centennial of Flight museum, which is located adjacent to the original visitors' center / museum is a futuristic looking structure that honors the 100 year celebration. This museum is home to a number of exhibits ranging from the turn-of-the-century 1900s Outer Banks environment that the Wright Brothers experienced for 3 years, the development of the Wright replicas, and a series of exhibits donated and maintained by NASA honoring aviation's future. Aviation lovers will find plenty to reasons to love the 428 acre park, which features relics from aviation's past as well as hints to aviation's future. That said, everyone will surely enjoy the incredible grounds and the towering monument which honors the region's most famous designation as the birthplace of flight. With nearly 500,000 visitors a year, it's clear that man's fascination with flight continues with vigor on the Outer Banks. 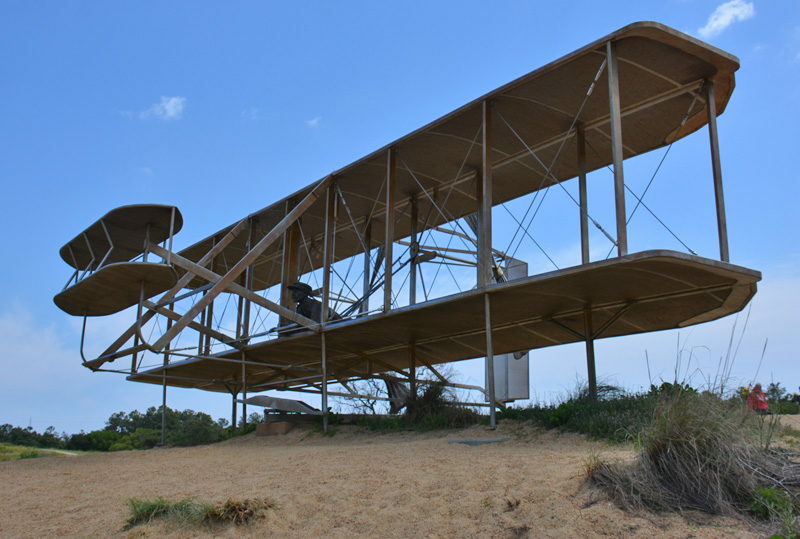 The Wright Brothers National Memorial is hard to miss for new Outer Banks vacationers, and is located in the heart of Kill Devil Hills with the official entrance located at mile marker 7.5. The National Memorial, visitors' center and Centennial Pavilion are open 9 a.m. to 5 p.m. daily, 7 days a week, year-round, and every day except for Christmas. A small fee is required to access the park, but is typically around the $4.00 range for adults 16 years and older. Annual passes are also available for unlimited entry into the park, and educational groups may have the option to obtain free access with advance notice and approval. To enter, visitors will go through the National Park's main gate and will pay before parking and having open access to the expansive grounds. National Park Service (NPS) rangers man the entrance booth and are happy to answer any questions a new visitor may have. Additional park interpreters are stationed at the visitors' center and are happy to provide further details on the Wrights' famous first flight, as well as the functions of the Wright Brothers National Memorial National Park itself. Before visiting, be sure and check out the National Park Service's event calendar for the Wright Brothers National Memorial Park. While events are featured throughout the year, especially during mid-December when the annual celebration of flight commences, the summertime seasons offers almost daily free programs offered and orchestrated by NPS rangers. These events can include daily talks outlining the facts and incredible feats of the Wright Brothers experiments, sessions exploring the development (and rivalry) of the North Carolina monument, and even in-depth explanations of the original glider itself. Special programs are also available for kids, including a "Wright Kite" kite building demonstration followed with a little kite-flying and wind testing within the park's grounds. The Wright Brothers National Memorial is one of the most historically important destinations for aviation enthusiasts, but virtually every Outer Banks vacationer will enjoy a visit to the site for the fantastic architecture of the granite memorial, the informative and fascinating visitors' center, and the new Centennial of Flight complex that outlines aviation's future. Ideal for budding and recreational historians, pilots, and scientists, the Wright Brothers National Memorial is an educational attraction that's also big on purely fascinating fun. Be amazed at how a small wooden glider served as the first building block to modern airplanes, or simply enjoy a breezy stroll to the base of the monument for some incredible photo ops. The Wright Brothers National Memorial has been fascinating visitors for well over a century, and any Kill Devil Hills vacationer who can spot the granite structure in the distance, softly glowing at night thanks to well-placed floodlights, is all but required to make a visit and see the monument up close and in person. The Outer Banks have always been steeped in history, and the Wright Brothers National Memorial is just one of the islands' many testaments to the incredible cultural and historical legacy of this fantastic beach vacation destination. Where is the Wright Brothers National Memorial? The Wright Brothers National Memorial is located in the town of Kill Devil Hills in the central Outer Banks at Milepost 7.5. How do you get to the Wright Brothers National Memorial? The Wright Brothers National Memorial is impossible to miss, as it towers over the Kill Devil Hills landscape. Visitors can reach it by heading to US 158, also known as the Beach Bypass. The Memorial is located on the soundside (or western side) of the road, at Milepost 7.5. When is the Wright Brothers National Memorial open? The Wright Brothers National Memorial is typically open daily from around 9 a.m. until 5 p.m.
Can you walk up to the Wright Brothers National Memorial if the park is closed? Because the Wright Brothers National Memorial is located in a roughly 430 acre gated site, you cannot visit the memorial itself when the park is closed. Can you visit the Wright Brothers National Memorial if it’s raining? Because the Wright Brothers National Memorial has a visitors’ center with exhibits, it can be visited on a rainy day. Visitors will just want to avoid climbing up the hill to the base of the memorial itself if they want to avoid the wet weather. Is the Wright Brothers National Memorial open all year? The Wright Brothers National Memorial is open all year long, and even has special annual celebrations in December to coincide with the First Flight, which launched on December 17, 1903. When was the Wright Brothers National Memorial built? The Wright Brothers National Memorial was authorized in 1927, and was first opened and dedicated on November 14, 1932. Orville Wright was in attendance on the occasion, which marks one of the few times in history that a living honoree attended the dedication of their own memorial. How tall is the Wright Brothers National Memorial? The Wright Brothers National Memorial is 60 ft. tall which makes it one of the tallest manmade landmarks on the Outer Banks, (outside of the region’s lighthouses.) It’s also perched on top of a 90’ foot tall hill. What is the Wright Brothers National Memorial made of? The Wright Brothers National Memorial is made out of granite. Does the Wright Brothers National Memorial have a museum? The Wright Brothers National Memorial does have a visitors’ center / museum, which has a number of exhibits as well as an on-site book store. Does the Wright Brothers National Memorial have a gift shop? The Wright Brothers National Memorial has a book store, which also features a number of gifts, apparel, and other items and souvenirs. Does the Wright Brothers National Memorial have restrooms? There are public restrooms at the Wright Brothers National Memorial. Is there food or restaurants at the Wright Brothers National Memorial? There are no restaurants, food trucks, or other eateries within the 430-acre Wright Brothers National Memorial Park, however, visitors are welcome to bring along their own snacks and lunch and have a picnic on the spacious grounds. What are the exhibits at the Wright Brothers National Memorial? The Wright Brothers National Memorial has a number of indoor and outdoor exhibits in addition to the granite monument itself. These include markers of where the initial flights landed, a reconstructed 1903 hanger, a reconstructed 1903 quarters and workshop, and a Visitors Center. When was the First Flight? The First Flight was conducted by Wilbur and Orville Wright in the town of Kitty Hawk on December 17, 1903. Where was the First Flight? The 1903 First Flight occurred in the town of Kitty Hawk on North Carolina’s Outer Banks. Does it cost money to see the Wright Brothers National Memorial? Do you have to climb to see the Wright Brothers National Memorial? There is a bit of a gently sloping climb to get to the base of the Wright Brothers National Memorial, as it is located on top of a 90’ ft. tall hill. There are no stairs involved to reach the base of the monument, however. 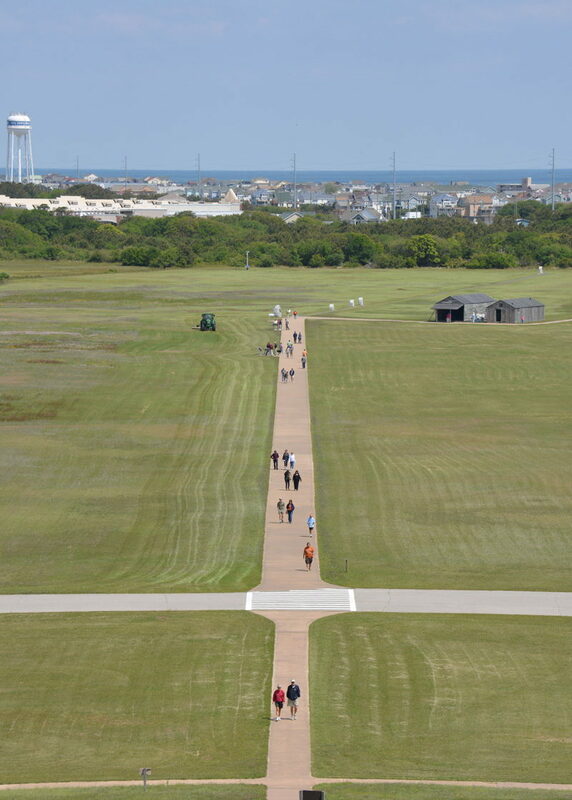 Can you ride bikes on the paths at the Wright Brothers National Memorial? Bikes are not allowed on the paths that lead to the base of the Wright Brothers National Memorial. Other vehicles, including motorcycles, cars, or scooters, are not allowed on the paths as well. Can I bring a pet to the Wright Brothers National Memorial? Pets are allowed at the outdoor facilities of the Wright Brothers National Memorial provided that they are on a leash that is 6 foot long or less. Can I fly a drone at the Wright Brothers National Memorial? Drones are not allowed within the Wright Brothers National Memorial park. Are there mosquitos and bugs at the Wright Brothers National Memorial? There can be summertime mosquitos and other bothersome insects at the Wright Brothers National Memorial. Folks will want to bring along bug spray in the warm weather months if they intend to explore the outdoor landmark and the grounds. The speed limit throughout the Wright Brothers National Memorial Park is 25 mph. Is the Wright Brothers National Memorial being renovated? The visitors’ center of the Wright Brothers National Memorial is being renovated during the spring and summer of 2018. There will be a temporary visitors’ center available during the renovation. When is the Wright Brothers National Memorial being renovated? The Wright Brothers National Memorial’s visitors’ center is being renovated during the spring and summer months of 2018, and is expected to reopen to the public in August of 2018. Is there an airstrip at the Wright Brothers National Memorial? There is a small airstrip that is located next to the Wright Brothers National Memorial. The unattended airstrip is open a half hour before sunrise until a half hour after sunset. Aircraft may freely park in the tie-down area for 24 consecutive hours or 48 total hours over any 30-day period. Are there special events at the Wright Brothers National Memorial? The Wright Brothers National Memorial hosts a number of lectures and programs on a regular basis throughout the busy summer months. In addition, the Wright Brothers National Memorial hosts an annual celebration on the date of the First Flight, which is December 17. Where can you stay near the Wright Brothers National Memorial? Because the Wright Brothers National Memorial is situated in the center of Kill Devil Hills, it is close to a number of vacation rental homes of all sizes, hotels and motels, as well as several campgrounds. This area is considered one of the largest communities – with the most accommodation options – in the Outer Banks. What attractions are close to the Wright Brothers National Memorial? The Wright Brothers National Memorial is close to a wide array of Outer Banks attractions, including the Nags Head Woods Ecological Preserve, the Jockey’s Ridge State Park, several fishing piers, and a collection of shops, restaurants and beaches.